Recently Microsoft released the December Partner Build (RC1) of Internet Explorer 8 with version number 8.0.6001.18344. The Redmond Giant is looking forward to release the final IE as early as possible. The beta life of IE8 is ended and steps are taken forward as it seems after the release of RC1 to the TechNet subscribers this month. The IE team considered many aspects regarding a safe, secure and enhanced browsing experience to be provided to the users and so with additional functionality to the existing Beta2 the Release Candidate1 is on the floor. Accessibility-ARIA: The camelCased syntax no longer exists for the ARIA(Accessibility Rich Internet Application) attributes as ARIA attribute names containing dashes, such as “aria-checked”, no longer have to be referenced by their camelCased equivalent (ariaChecked) in IE 7 mode and Quirks mode. Ajax-XDR: XDR (Cross Domain Request) now checks Access-control-Allow-Origin header for specific URLs as well as wildcards. Developer Tools: As in previous versions of IE like IE7 and IE8 Beta2 view source application in developer tool was only notepad and built-in viewer respectively. But now user is free to choose developer tool as per requirement via the Developer tool’s menu option. This provides more flexibility to the IE users. For web applications supporting both IE7 and earlier as well as IE8 standards mode, this meant maintaining both declarations and possible a third for other browsers in the case of opacity. Starting with IE8 Partner Build, the first declaration above will be applied in standards mode if and only if its syntax is valid. If it is not e.g. the final parenthesis is missing then the declaration will not be applied and our CSS parser fails per the standard. • CSS style sheet encoding detection complies with CSS 2.1 e.g. including @charset directive, charset attribute on link element etc. 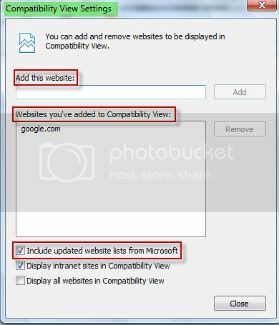 Compatibility View List: A new option for receiving updated lists of websites to be viewed under compatibility view is added under the compatibility view settings but still users can’t avail this facility update Until next release of IE. Filter Syntax Property: IE8 will accept the current filter syntax as well as the fully quoted syntax (“-ms” prefix) previously announced for IE8 in the Microsoft CSS Vendor Extension blog post. Links Bar: Now users can customize the title widths of the items on Favorites bar and can place as many items as they want. 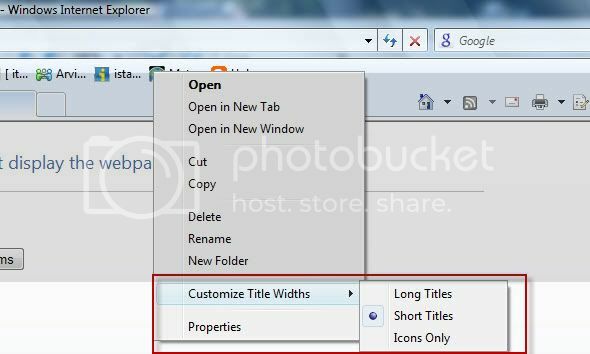 Via this new option the size of Link bar items can be set to long(default), short(5 chars), or simply favicon. • InPrivate Blocking can be turned on or off via its button present on the status bar. • InPrivate Blocking can be turned on or off from Safety Menu’s entry or use keyboard shortcut Ctrl+Shift+B. • It is now session-specific as will be off by default each time users launch IE. • InPrivate Blocking can be turned on for all browsing sessions, not just InPrivate Browsing. 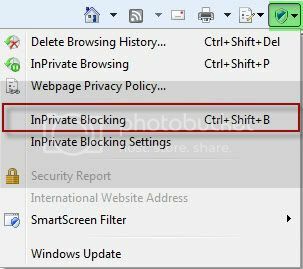 • InPrivate Blocking settings dialog UI is improved. • New feature first run dialog box. InPrivate Subscriptions: InPrivate subscriptions have been removed. InPrivate Browsing: While in InPrivate Browsing Add-ons will be disabled. • Typed address count increased(up to 12 default, up to 25 in case History and Favorites are turned off). • By default Feeds are turned off. In order to turn it on check feeds from AutoComplete Settings dialog in ‘Tools->Internet Options->Content->AutoComplete Settings’. • Option “Add to the top of the list” is working now. • Accelerators can be imported successfully. • RIES Remove Branding feature has been cut. • Turn on Caret Browsing support. • Turn off Cross Domain Request Object. • Maximum number of connections per server (HTTP 1.0 and HTTP 1.1) changed from 2 to 128. • Turn off Compatibility View button. • Turn off the feeds list. • Always use InPrivate Blocking. • Do not collect InPrivate Blocking data. • Disable toolbars and extensions when InPrivate Browsing starts. 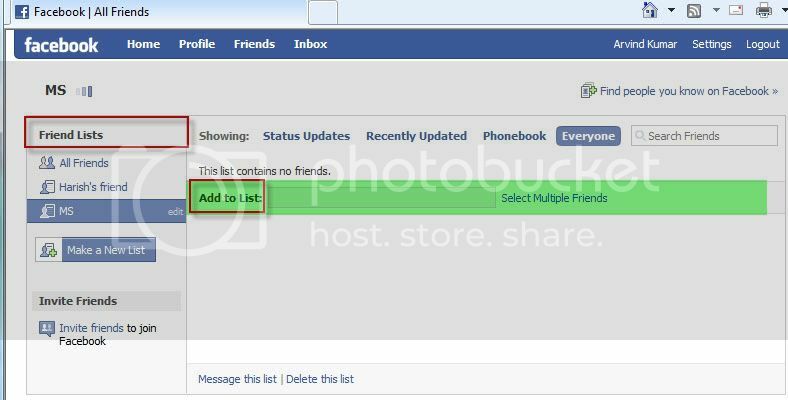 IE8 Partner build has known issue of the Facebook friends list program. The Browser hangs when user uses the “Add to list” box from the friends list. At this time there is no workaround. 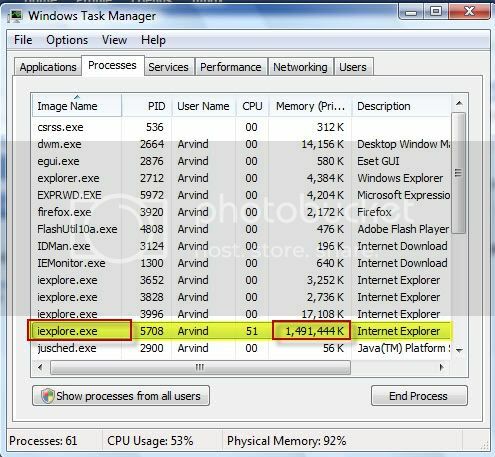 Here is a view of the issue when the browser hangs and it eats up all the memory of your system so as no other process have room to run smoothly. HTTP error which comes after using add to list box in friend list.